Frank Lloyd Wright has been immortalised in so many ways – not the least of which has been the influence he has had on residential architecture. He was born in 1867 and died in 1959 and is thought by by many to be the most influential American architect during the first half of the 20th century. His worked spanned between 1887 and 1959 - during which time he built 362 houses of which about 300 survive. He was responsible for over 500 buildings. “Heath House” (Buffalo, NY) with “Robie House” (Chicago) and “Cooley House” (Louisiana) also being considered as masterpieces. These houses were built between 1895 & 1920. 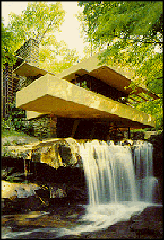 “Fallingwater” in Pennsylvania used concrete and cantilevers to coax Americans from their box-like houses; the origins of which dated back millennia. The design specifically produced for a client wanting a house at a favourite location found FLW designing a building over the falls themselves. In the depression years of the 1930s he developed the “Usonian” style that refelcted the focus on economy - the style being simple and unadorned and with there being no attic or basement. 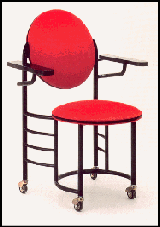 In later years this style became the Usonian Automatic - in which concrete blocks were used in the construction... Almost a prefabricated style. In June 1943 Lloyd Wright received a letter from the art adviser to art collector Robert Guggenheim. Guggenehim wished to house his collection of non-representational art and she wrote “ I need a fighter, a lover of space, an agitator, a tester and a wise man. . . . I want a temple of spirit, a monument! 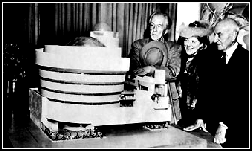 ” The resulting Guggenheim Museum is one of his later works.